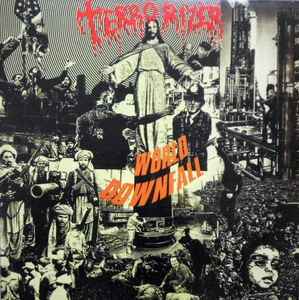 One of the best death - grind albums ever! Jesse Pintando's (R.I.P.) poisonous riffs, Pete's blastcore beats make the difference. Scott Burns' sound engineering is the 'cherry on the cake' - SUPER!! Does that mean that the record is available in 3000 ex? The original 1000 ex on black vinyl released in '89, rereleased 1000 ex on black vinyl in Europe and the rerelease in 1000 ex (700 green and 300 red)? The last 2000 being released in 2002? How would one see the difference between the rereleased black vinyl and the original black vinyl '89 release?